The Toronto International Film Festival Vanguard Blog: Toronto is a Comic Book Town!! This year, Vanguard features not just one, but TWO comic book-related films, Zoom and The Missing Girl! As much as Toronto is known as a film-loving town, it has a ton of love for the graphic arts as well. So, on your way to your next screening, stop into some of Toronto’s best places for all your comic book related needs! Yonge Street has so much to offer! 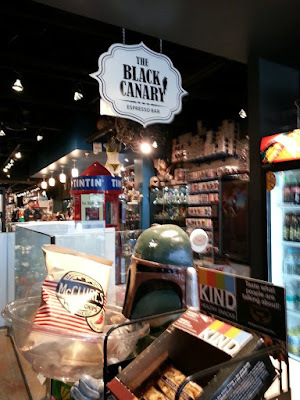 At Silver Snail, you can grab some coffee at the Black Canary Espresso Bar in the store while looking for your latest issue. Or up the street, you can shop comics, games, and more at One Million Comix and Next Move Games. Keep an eye open for Matt Hansen, the writer of Zoom, who stops in for his weekly fix! The Annex is really where it’s at in the way of comic book finds! First up is Labyrinth Comics is a collector’s friend with a wide variety of comic books, related items, cards, and much more. Though not necessarily a comic book store, I’d be negligent if I failed to mention the amazing used comics collection available at the Bloor Street BMV—sure, look at all the other books, but scour the thousands of back issues in their upstairs section! And now we come to The Beguiling. Don’t be afraid if you get lost in this store that is overflowing with the best collection of comic book art books around—you won’t be the first to lose time submerged in their stacks, and you won’t be the last! Stop in on the other side of the block at their little sister store, Little Island Comics, and pick something up for the kids in your life—or, go ahead and just get something for yourself at the first store in North America to cater exclusively to the young comic book enthusiast. And, if at all possible, plan on coming back to town for the Toronto Comic Arts Festival in May—organized by Beguiling’s staff and the help of the Toronto Public Library system, TCAF has made a name for itself in a few short years as one of the best independent comic arts festivals and attached librarian and educators conference all in the name of promoting visual literacy and comic book culture. If you can’t make, at the very least, you should check out their year-round shop on the main floor of the Toronto Reference Library, Page & Panel. The above are just a small taste of what Toronto has to offer in the way of comics. If you need to get away from the hustle and bustle for a bit, check out the following places and explore a little more of the this comics-and-film-loving town! One of my first stops when I get to Toronto is the amazing Comic Book Lounge + Gallery. But whatever you do, be sure to make your way to the screenings of Zoom and The Missing Girl!